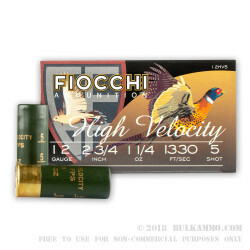 For the upland game hunters who want a little more power from their payload, these 12ga shells by Fiocchi produce higher velocities than other comparable shotshells. 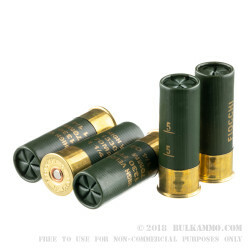 Each 2-3/4" 12ga shell contains 1-1/4oz. of #5 shot. These 12ga shells can reach upland game previously out of range by firing far-reaching concentrated clouds of #5 shot at 1330 fps. The higher velocity does mean a harder kick from your shotgun, but the payoff is well worth the extra recoil. 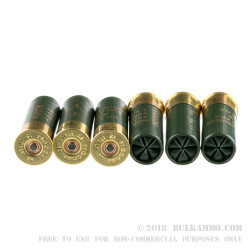 These shotshells are contained in reloadable plastic shells. 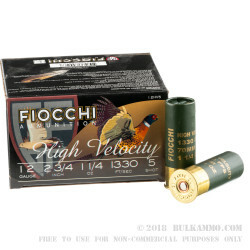 Fiocchi uses carefully selected primers to ensure the payloads are propelled reliably from the chamber shot after shot. The affordability of these 25-round boxes means you can pursue your favorite hobby without destroying your bank account. 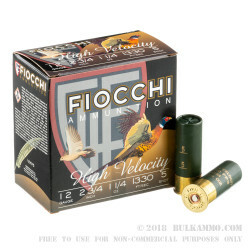 Order a few boxes of this 12ga ammo by Fiocchi today!